Leh, capital of Ladakh, reveals a very different side of Jammu & Kashmir. Here verdant meadows give way to grandiose mountains whose bare austerity is broken only by white-clad monasteries. The air is bracing and the faces make one think of nearby Tibet. The kingdom of Ladakh was created in the 10th century when Prince Nyima Gon conquered the Western part of Tibet with an army of 300 men. It is thought that several palaces and towns in Ladakh were founded by Nyima Gon, and that the main sculptures in Shey monastery date from his reign. Leh, 3500 above sea level, was an important staging post on the famous silk route. Above the town stands Leh palace, once the residence of the Ladakh royal family and built along the same lines as the Potala in Lhasa, Tibet. 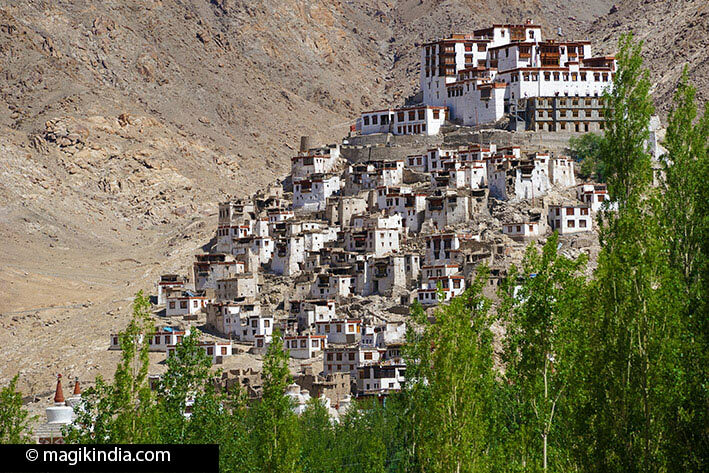 Leh’s main attraction is its many Buddhist monasteries or gompas, each one lovelier than the next. From Thiksey monastery you can enjoy a magnificent sunset; Alchi monastery is a gem, with splendid wall paintings; Hemis, one of Ladakh’s largest gompas, has a spectacular annual religious festival. 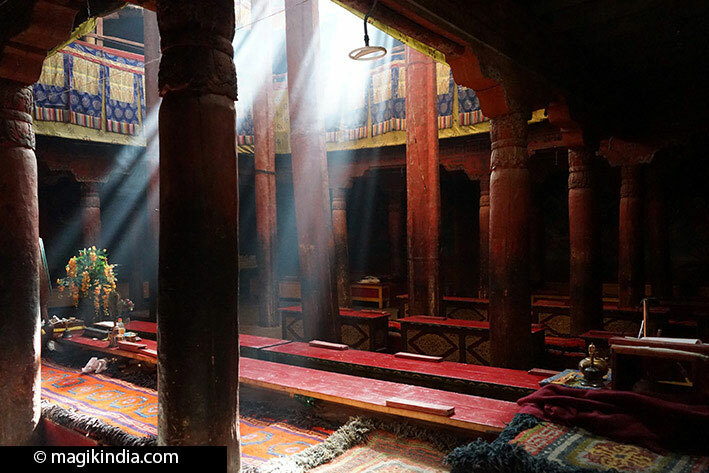 Hemis Monastery is a Tibetan Buddhist monastery located in Hemis, 45 km from Leh. 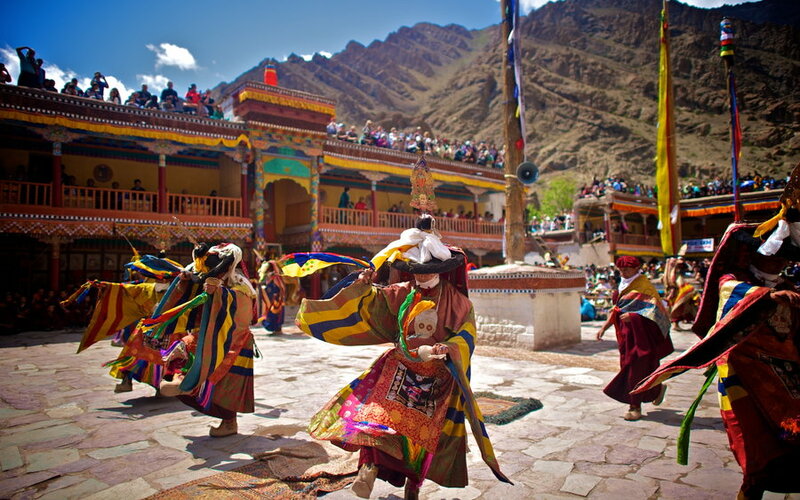 The Hemis Festival is dedicated to Lord Padmasambhava (Guru Rimpoche) venerated as the Dance performance. It commemorates the birth of Guru Padamasambhava, who is said to have brought Vajrayana Buddhism to Bhutan and Tibet. Revered throughout the Himalayan ranges and considered the second Buddha, Guru Padmasambhava was invited from India in the 8th century to conquer the dark forces and transform them into guardians and protectors of the pure dharma. 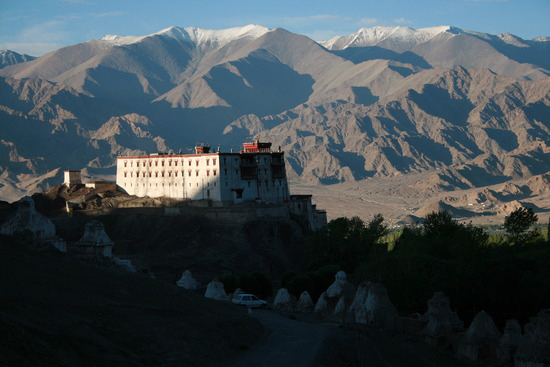 Leh Palace offers a splendid panoramic view of the town and the surrounding mountains. 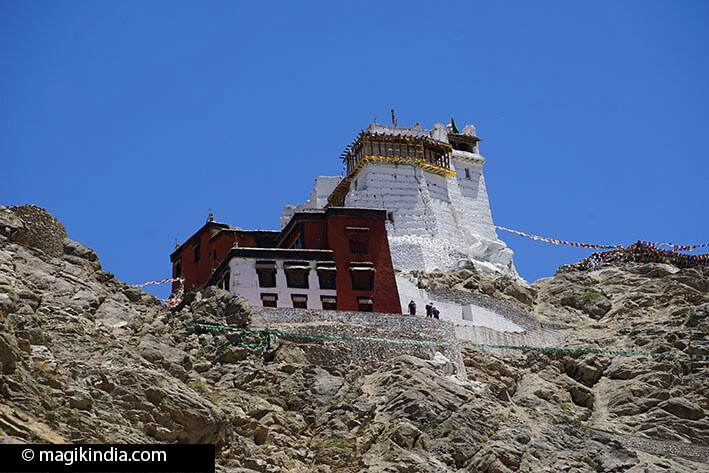 It was built by King Sengge Namgyal in the 17th century on the model of the Potala in Lhasa, Tibet. The upper floors of the nine-storey palace were the royal family’s apartments. The palace is currently undergoing restoration by the Archaeological Survey of India, but is open to the public nonetheless. 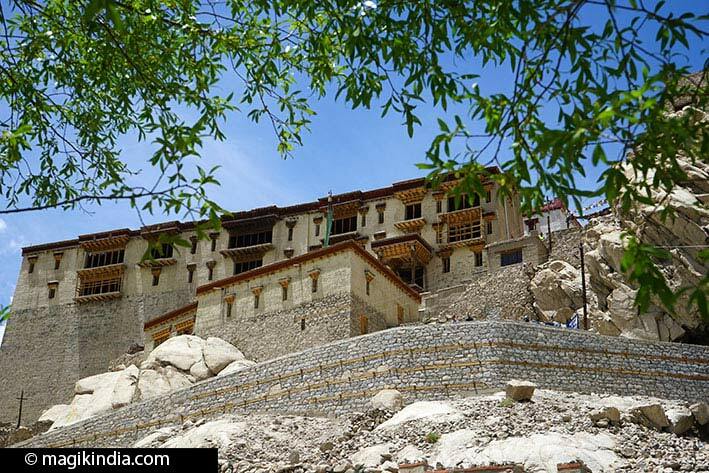 This small fort overlooking Leh Palace and the town was built in the 15th century by King Tashi Namgyal. It was the royal residence during the Namgyal dynasty and has a small temple inside. Just below it, two 15th-century gompas (Buddhist monasteries) house a guardian deity and a 10m gilded statue of the Buddha Maitreya. The fort and the gompas are open only when the monks come to perform their morning and evening rituals. 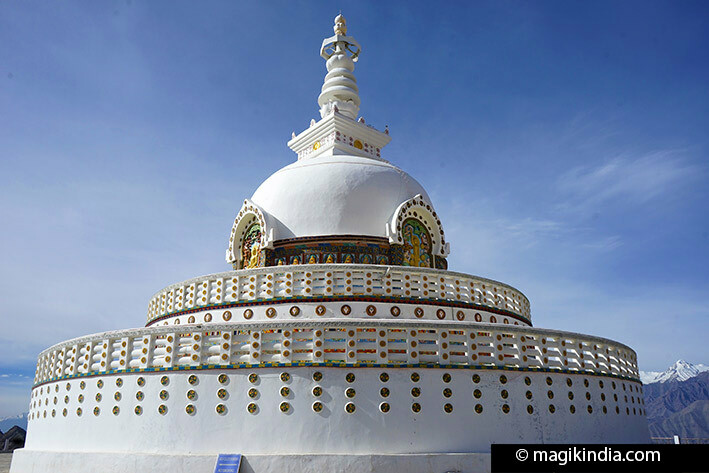 You can’t miss the white dome of the Shanti Stupa on its hilltop. It was built by Japanese and Ladakhi Buddhists and inaugurated by His Holiness the Dalai Lama in August 1991 to promote peace and prosperity in the world and to commemorate 2500 years of Buddhism. The stupa has a central statue of the seated Buddha “turning the wheel of Dharma”. This ruined stupa near the Shanti Stupa is said to be 600 years old and to have been built by King Graps-Pa Bum-Ide (1410-1440). There is an air of mystery around it. 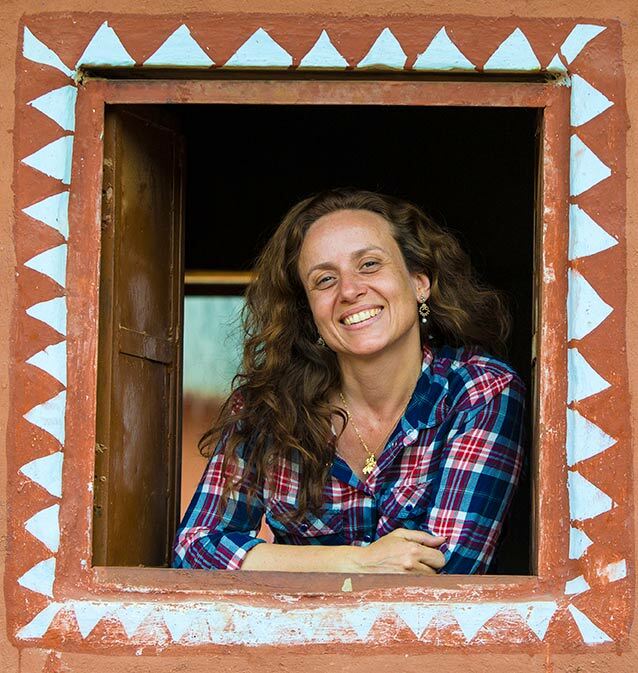 Le name Tisseru comes from the Tibetan for “yellow mule”. Legend has it that a yellow mule-shaped rock once stood on this spot and was inhabited by malignant forces that caused much misery to people in the area. One day the queen fell ill just as she was gazing at it. On the advice of wise lamas, the king had a stupa built on top of the rock to imprison the evil spirits. Tisseru, 55m in diameter, is considered Ladakh’s largest stupa. It combines the Indian and Tibetan styles of stupa building. 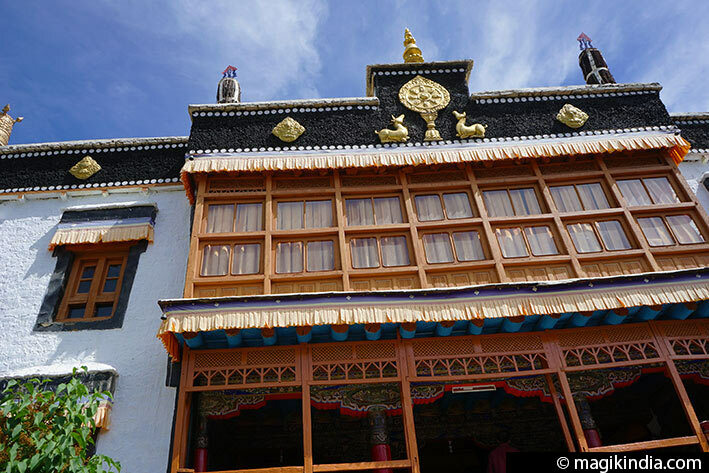 This small gompa 3km from Leh is a branch of Spituk monastery and is the official residence of Kushok Bakula, head lama of the Gelugpa order (the “Yellow Hat” order) in Ladakh. It has a library and a striking statue the bodhisattva Avalokitesvara with a thousand arms and a thousand heads. 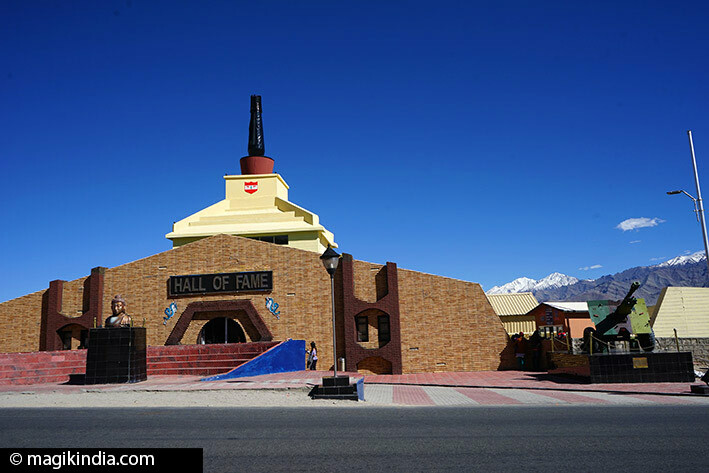 The Hall of Fame near Leh airport is a museum built and maintained by the Indian army to the memory of soldiers who lost their lives in the Indo-Pakistani wars. 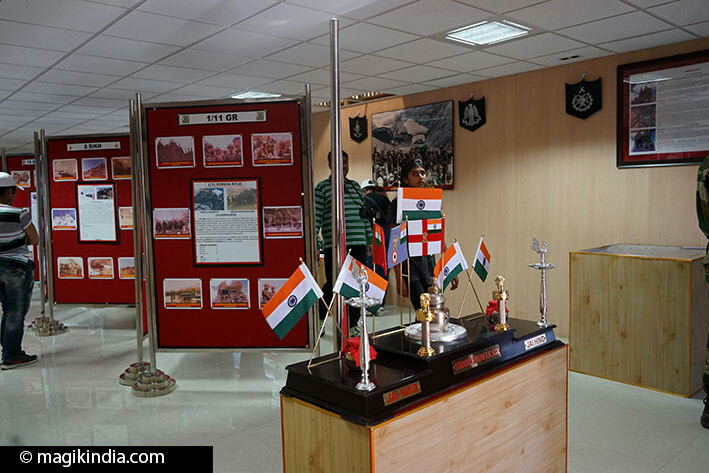 It has a souvenir shop and displays objects such as weapons and important documents from various wars (mainly the 1999 Kargil conflict). 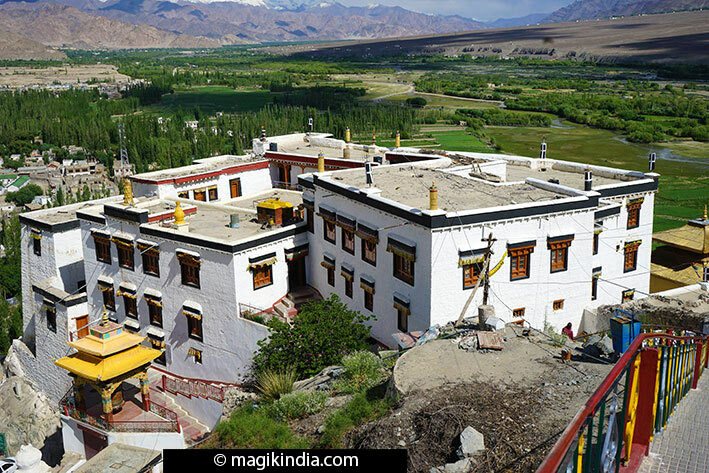 Stok Palace, about 15km from the town of Leh, was built by the king Tsespal Tondup Namgyal in 1825 and is currently the residence of the descendants of King Sengge Namgyal. Its architecture is a mixture of the traditional Buddhist and modern styles. Its library boasts the entire Kangyur (Tibetan Buddhist canon) in 108 volumes, and a collection of royal costumes and jewels. Spituk (“the exemplary”), overlooking the Indus valley, is a Buddhist monastery founded in the 15th century by Od-De. It is home to a community of about a hundred monks and boasts a large number of Buddha figures and fine thangkas (Buddhist paintings on fabric). On top of the hill stands the Mahakal temple, containing the shrine of Vajrabhairava (Kali). The goddess’s terrifying face is unveiled only during Spituk’s annual Gustor festival. During the festival, the lamas wear the masks of various deities and perform dances representing events from Tibetan Buddhist mythology. Shey Palace and its monastery stand on a hill in the village of the same name, 15km south of Leh. The palace used to be the summer residence of the kings of Ladakh. 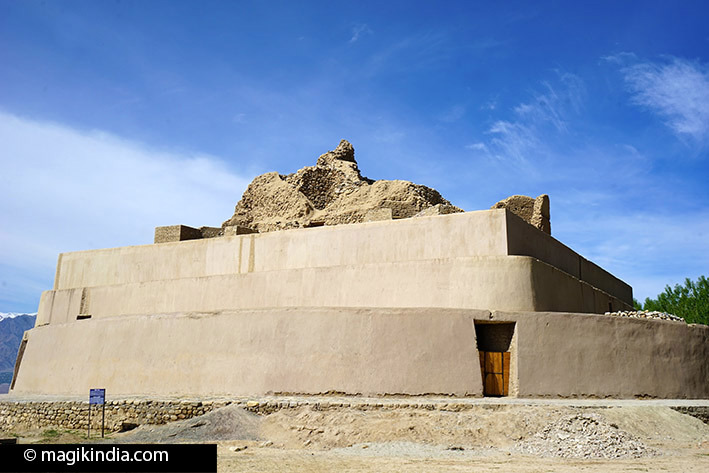 The palace, now largely in ruins, was built in 1650 by Deldan Namgyal, king of Ladakh (also known as Lhachen Palgyigon). The royal family moved out, into their newly-built Stok palace, in 1834. Shey Palace boasts Ladakh’s largest victory stupa (Namgyal Chorten), the tip of which is made of pure gold. Shey monastery also dates from the 17th century. Deldan Namgyal had it built inside the palace complex in memory of his father Singay Namgyal. The monastery’s main hall boasts a 12m gem-studded gilded statue of the seated Buddha Shakyamuni. Perched on a hill in the village of Thiksey, 20km from Leh, Thiksey Gompa is a monastery of the Gelugpa (Yellow Hat) order of Tibetan Buddhism. It was founded in the 15th century along the lines of the Potala in Lhasa, Tibet, and is often called the “little Potala”. It has ten temples and houses about a hundred monks. 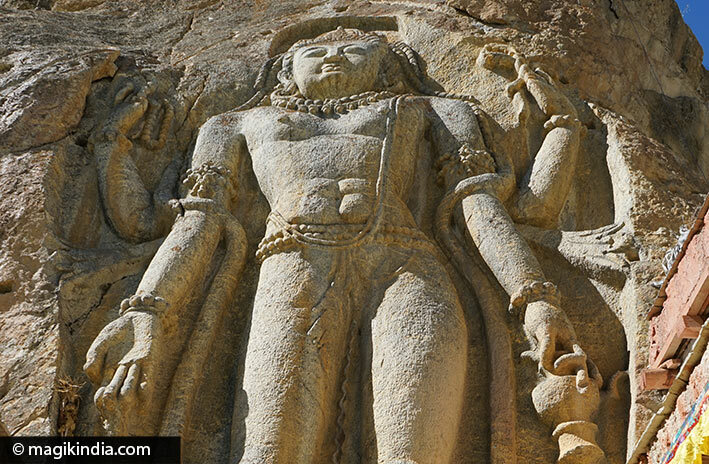 Among its many items of Buddhist art is an imposing statue of Maitreya (the future Buddha) – 15m tall and the largest in Ladakh. 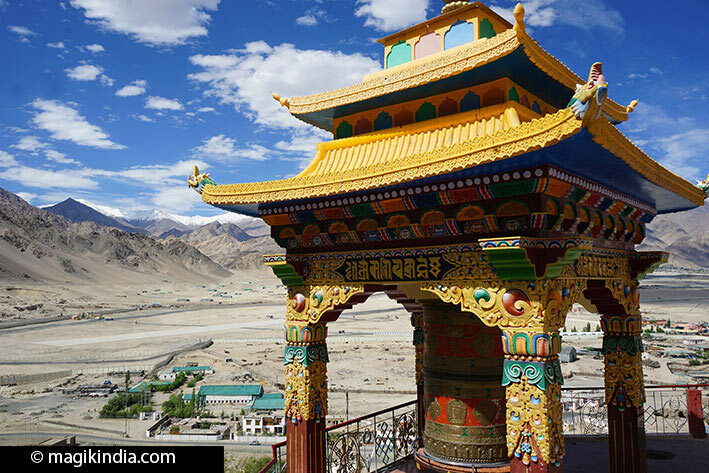 It was installed to commemorate the visit of the 14th Dalai Lama in 1970. Chemrey monastery stands atop the hill of the same name, its buildings staggered down the hillside like a medieval European hill village. 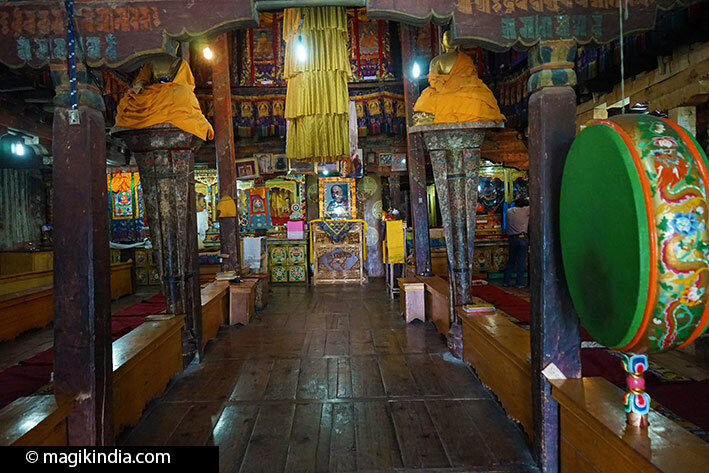 It was founded in 1644 as a memorial for Sengyé Namgyal. About 120 lamas of the Drukpa (“Red Hat”) order live there. 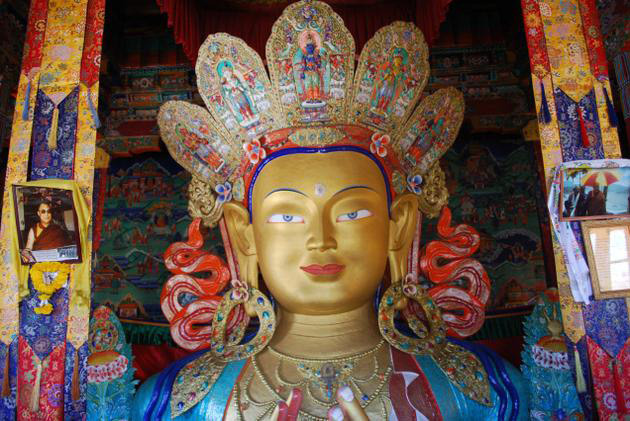 The monastery boasts a large statue of Padmasambhava and a big collection of precious scriptures. 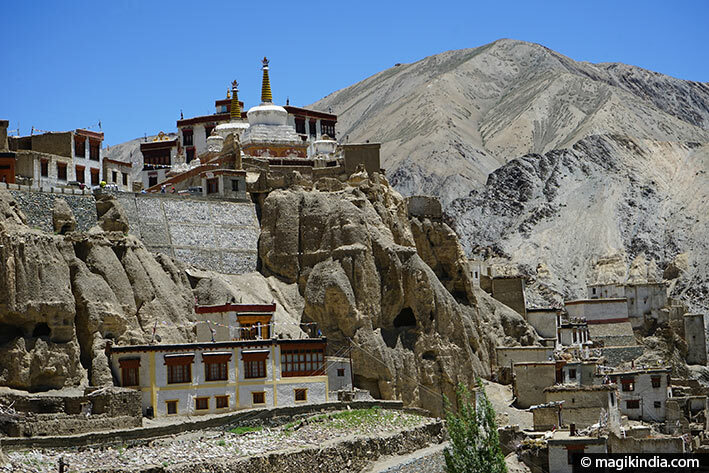 Hemis is one of the most remarkable Buddhist monasteries in Ladakh. Hidden away in a gorge 47km from Leh, it is reached by sinuous roads through magnificent mountain landscapes. 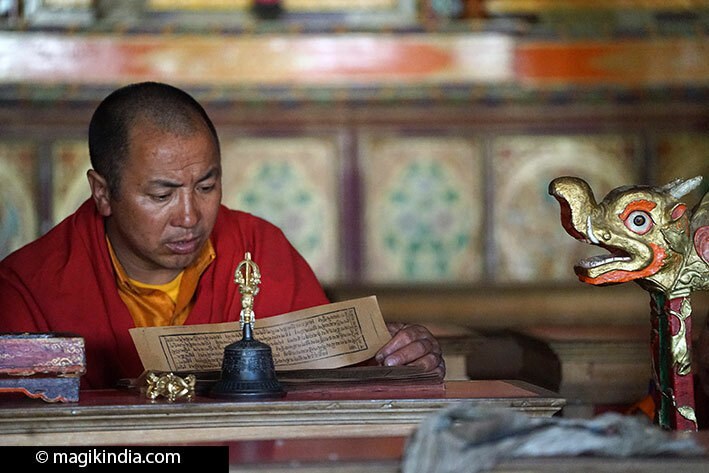 It belongs to the Drukpa order (the “Red Hats”) and was founded by Stagsang Raspa Gyatso Nawang in 1630. It boasts a large library of Tibetan books and a most impressive collection of thangkas (Buddhist paintings on fabric) and gem-studded statues. A pleasant 3km walk above the monastery will take you to a hermitage that is older than the monastery. You can see the hand and foot prints of Gyalwa Kotsang, the original hermit, in the rock. 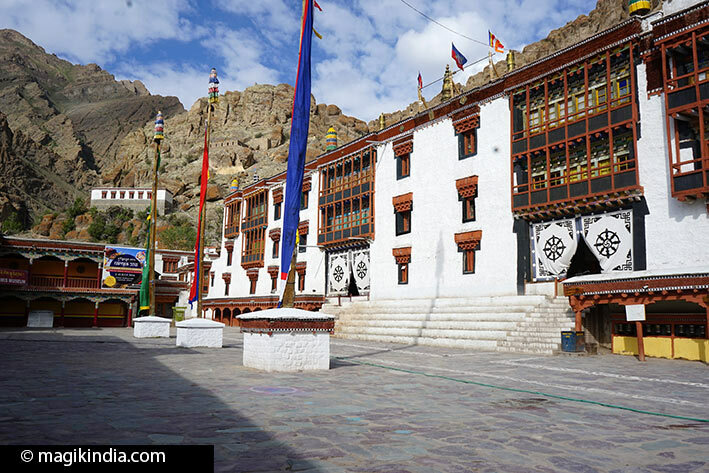 Hemis monastery is also renowned for the Hemis Festival, commemorating Padmasambhava (or Guru Rimpoche). He is believed to have been born on the 10th day of the 5th month in the year of the monkey and his life mission was (is) to improve the spiritual condition of all living beings. Once every 12 years, when the same astrological configuration recurs, Hemis puts on a huge spectacle to his memory. The ceremonies start in the morning with a ritual at the top of the monastery where, to the sound of drums and cymbals, the portrait of Guru Rimpoche is displayed for everyone to worship. 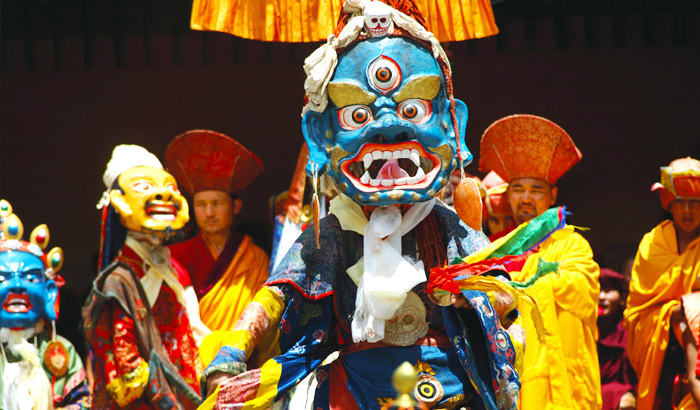 Monks then perform sacred masked dances in the Tantric tradition. 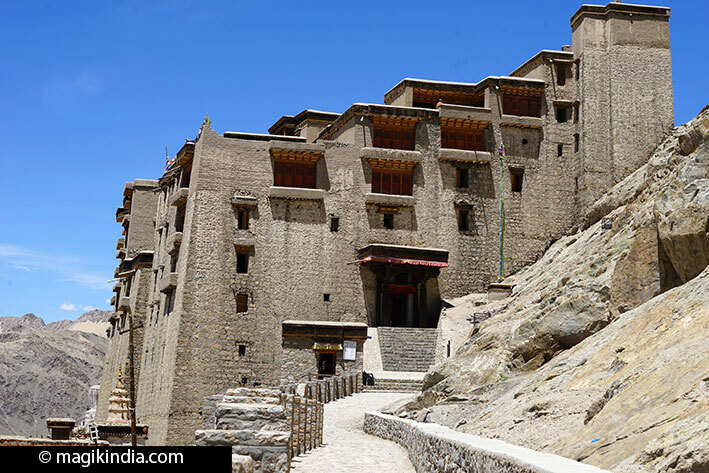 Seventy kilometres from Leh on the banks of the Indus stands Alchi Gompa, a gem of a monastery which is regarded as one of the most important Buddhist centres in Ladakh. 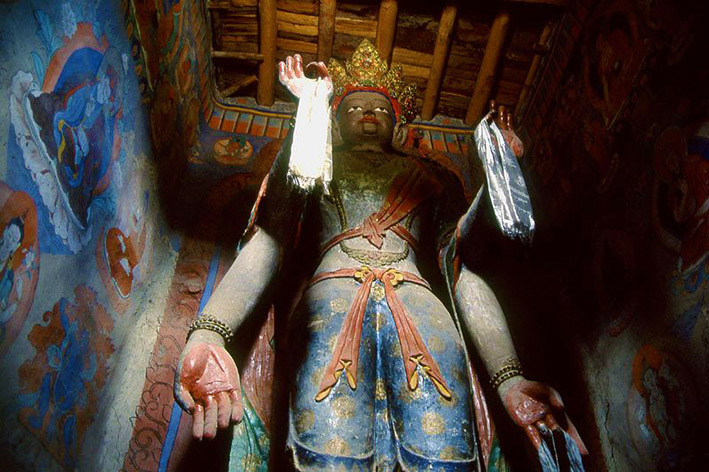 It is a complex of five temples with splendid 11th- and 12th-century wall paintings and an impressive clay statue of Manjushri, bodhisattva of wisdom, painted with mineral pigments. The area around the gompa offers visitors a friendly welcome with tea stalls, souvenir shops and homestay accommodation. 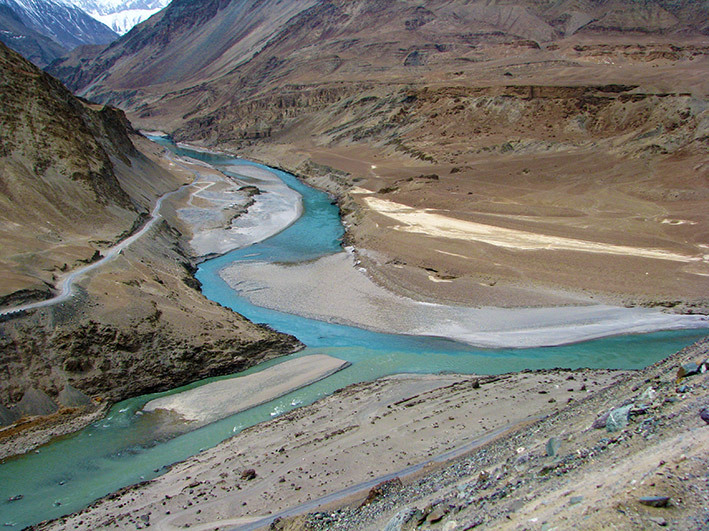 The green-brown waters of the Zanskar merge with the blue Indus amid picturesque scenery near the town of Nimmu in Ladakh. Both rivers flow down from their sources in the Himalayas to meet here. Rafting is organised on both rivers as they feature rapids ranging from class I to class V.
Lamayuru monastery offers travellers a restful halt on the bumpy Kargil-Leh road. It was founded in the 11th century by Mahasiddhacharya Naropa and belongs to the “Red Hats” branch of Tibetan Buddhism. It houses more than 150 monks and a rich collection of wall paintings, thankas, carpets and statues including an impressive thousand-eyed Avalokitesvara. The Dras valley starts from the Zojila Pass (3500m) on the road between the Kashmir Valley and Ladakh. Known as the second coldest inhabited region in the world in winter (-45°C), in summer it offers landscapes of incredible beauty that will almost make you forget the tough going. The Dras War Memorial, also known as the Vijaypath, in the foothills of the Tololing range, was built by the Indian army. It bears an epitaph with the names of all the Indian officers and men who died during the Kargil war between India and Pakistan in 1999. 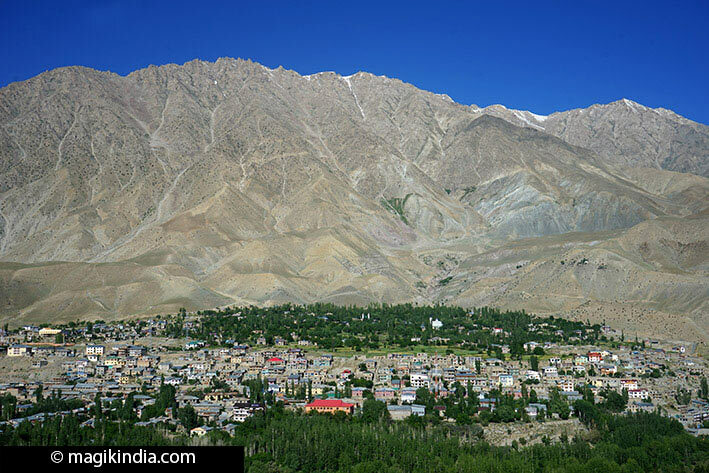 Kargil, on the banks of the Indus, is Ladakh’s second largest town after Leh. There is nothing special to see here; it is mainly a transit town and a well-merited halt on the Srinagar-Leh road. Kargil became notorious with the 1999 Kargil War when the Pakistani army took over the town and its environs. 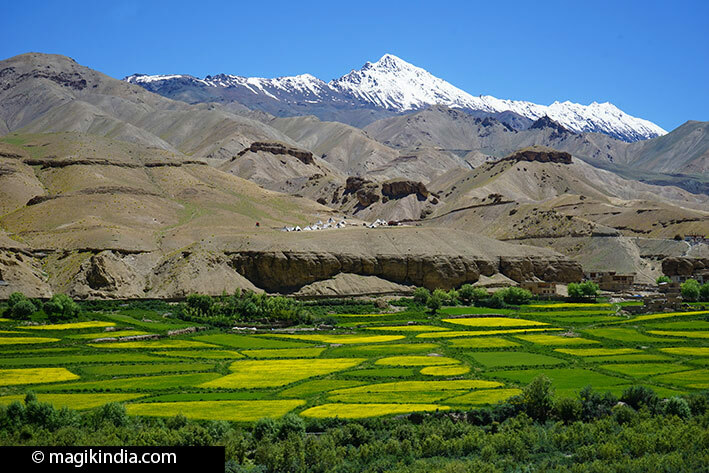 You can take a three-day organised trek from Kargil to the Suru valley passing through mountain villages and superbly lovely flower meadows. Carved from the rock 50km from Kargil and 1km from the town of Mulbekh stands a 9m statue of the Buddha Maitreya, the future Buddha. Some think the statue dates back to the Kushan period in the early years of our era but historians think it is more likely a 13th-century work. In Buddhist mythology Maitreya is the fifth of 1000 Buddhas who will appear in the world.